Purrtopia Persians and Exotics is my 3rd entre in the cat fancy. I began in 1972 with my first Persian, Cleo, who was a tortoiseshell female. I convinced my dad to buy her because it was Mother’s Day, and our Siamese had recently passed. When Cleo was old enough to breed, I found a lovely woman named Dorothy Johnson in St. Paul who allowed me to use her male for a stud fee. I was so excited for that litter of kittens, and I became a breeder. I named my first cattery Mi-Lisa Cattery. I kept a blue cream girl out of the 1st litter, and I named her after my aunt – as she was born on her birthday. 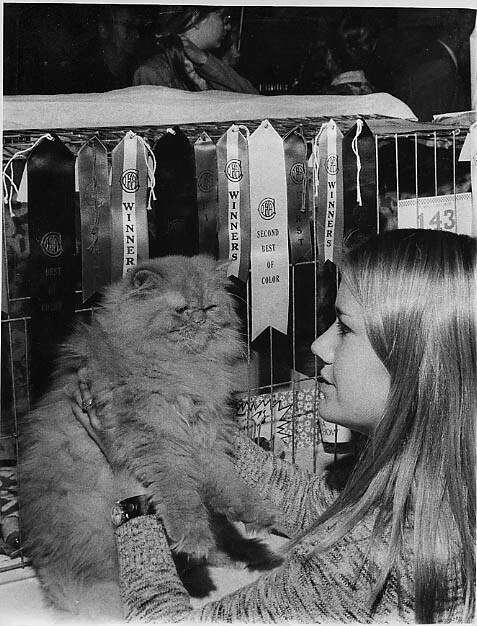 I was able to convince my parents to drive me in to the City for the cat show locally, as I was just 12 years old. At the show I met many of the breeders that I had been talking with on the phone. Back then I would call everyone advertising Persians in the newspaper classified ads from the Sunday paper. Eventually I bought more kitties from local breeders. A wonderful woman named Audrey Boss must have thought I was a good kid, and she gave me my first show cat. He was Puff n Stuff Big Red of Mi-Lisa. You can see him in the picture with me with his winners ribbons at the show where he got his CFA Championship. The Persian standards have changed so much since then! In about 1975 I bought a lovely red female named Red Sky Strawberry Fields from Gary Powell, as I was focusing on reds back then. Until suddenly there were bi-colors! As much as I loved my kitties - I got married, had a baby and I just didn’t have the time and money to devote to my exhibitor hobby. So I kept my kitties as pets, and took a long break from breeding and showing cats. 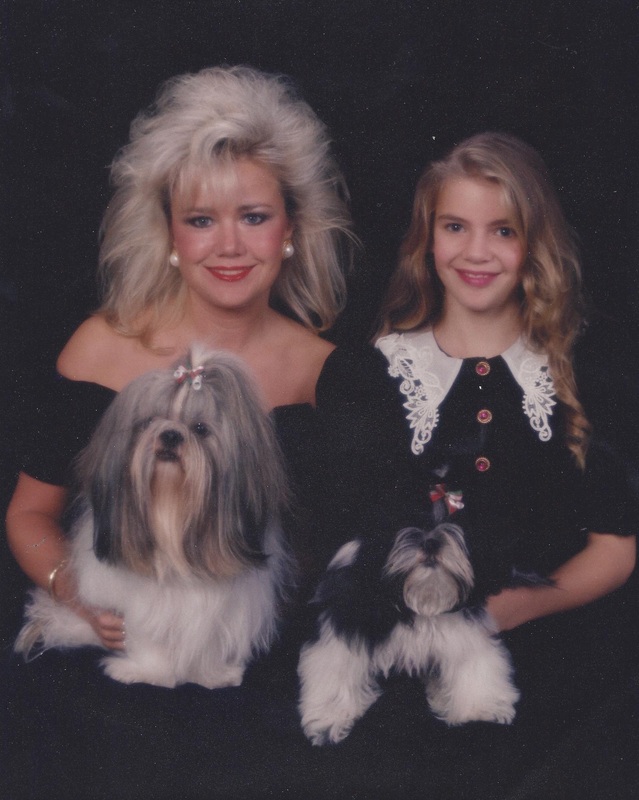 I did breed AKC Shih Tzu’s for a bit, and I also showed my AKC Afghan Hound Nikita. 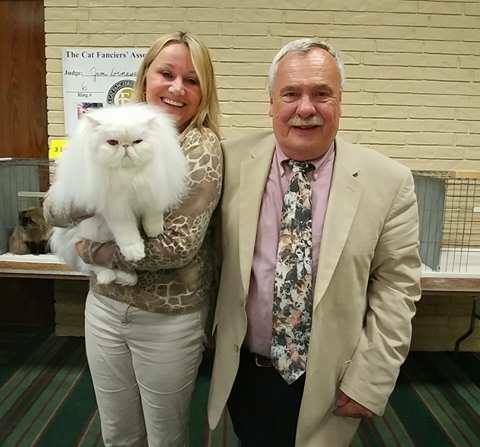 Eventually my daughter and I began showing and breeding CFA Persians again. We came back to the cat fancy as Jordanalisa Persians. We produced many gorgeous kitties, and focused on bi-colors. We showed all over the US, and had many Champions, Grand Champions, Regional Winners, DMs, etc. in CFA. We had so much fun, and then my 1st grand baby Lili came. My daughter found herself in the same situation that I was in when she was born. She just could not devote the time. I struggled trying to do the kitties thing solo – but my two younger kids were keeping me very busy with their sports. Again I took a break from breeding and showing. But now since 2014… I’m back!! Some cherished friendships have continued over the years, and I have made some wonderful new friends too. I am so thankful for the camaraderie and all the laughs we have in the show halls, and beyond. I have to just call out some very special people who have been there for me – Sylvia Bruckman of Sybil Persians , Diane Wagner of Vareda Persians, Donna Waskewicz of Posh Persian, Andie O’Connor of Pearly Pond and Ruth West of Snomyst. Last but not least - my dear friend Susan who is no longer in the show halls, but is always there for a laugh or a cry. And she even built this website for me! If not for all of you, I would simply not be back. I love you all. Our new foundation Persian boy came to me as I was trying to find kitties with the “look” I wanted to reproduce. My dear friend Sylvia was keeping her eye out for a kitty for me, and suddenly a boy that was out of her lines became available – so I jumped at the chance. He is our odd eyed white big boy that we affectionately call “Bowie”. We got him late in 2015, and really struggled with what to call him – as his registered name is Sapphire Ice. Not really something that lends itself to an easy nickname. Oddly (no pun intended) someone suggested the nickname Bowie – because David Bowie the musician had one blue and one brown eye. I was considering whether or not this was a good fit, and on January 10, 2016 – the original Bowie died. I was floored by the news, and my gorgeous white kitty instantly became Bowie. Bowie is soon to be retired, but we have kept back some of his stunning offspring. So yes, I am back again with my somewhat reluctant husband Mark 😉 – with an exciting new twist!! 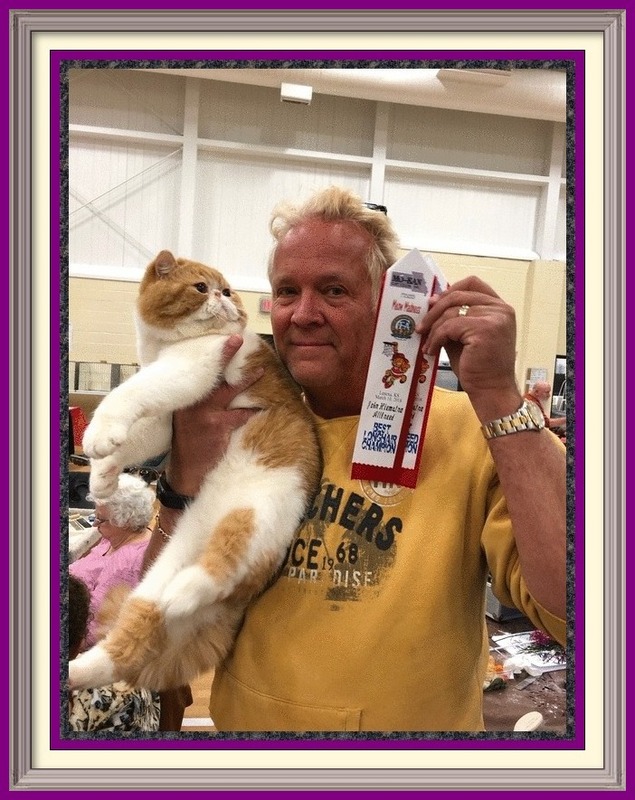 I am not only focused on the best quality Persians, but even more so on the Exotic Shorthair breed! I have granded several of our beauties now, and gotten regional recognition as well. We just love the “Zots” and are thrilled with what we have been able to produce. My husband has become very fond of the Exotics breed, and is very involved in the cat fancy now. I could not do this today without his help and support. Our children and extended family members also co-own and house several of the cats with us, and we also co-own with a few trusted exhibitor friends. This allows us to keep the gene pool broad, yet maintain a “closed cattery” and focus on having our kitties be very socialized family members. We occasionally have kittens available, so feel free to keep an eye on our available page, or send us an email. I am so happy to be back, and I look forward to seeing everyone at the shows!